Over the last few years, my partner and I have been trying really hard to buy less stuff. Especially at times like Christmas when it’s so easy to spend money you don’t really have and then get things you don’t really use. We’d rather save our $ for the things and experiences that matter the most to us, so we think long and hard before we buy anything new. But, sometimes there are good reasons to buy a thing. Maybe it’s super good for your health and well-being. Perhaps it’s not very expensive. And what if it’s Christmas and people expect gifts because that’s just our culture? If you’re in the market for a gift that hits all these marks, then I suggest you consider putting some toe spreaders on your shopping list this year. Either for your loved-ones or for yourself! Here’s why I love toe spreaders, why each brand is a bit different, and links to some of my favourites. Ever since we were babies, our feet have spent most of their time in shoes. Modern shoes are TOO NARROW in the toes. And that means our toes have been artificially squished together since day one. The result? Most of us have toes that are too close together, with weak muscles, not much space for nerves, and poor circulation. And many of us get issues relating to squished toes, like bunions, hammertoes and neuromas. Squished toes can be changed, but it’s a long term project. To restore space between the toes, foot mobility, and foot strength, we need to add forces that gradually return the foot bones to the place they belong. Although exercises and barefoot walking are a big piece of the puzzle, this is one of the few times when there’s a shortcut: toe spreaders. Toe spreaders are little devices that fit between the toes and hold them spread apart. You instantly get better circulation, and as you walk around in them, your toe bones and muscles gradually restored to better alignment. There are lots of types of toe spreaders. It can be confusing to figure out which ones are best for you or to give as a gift. 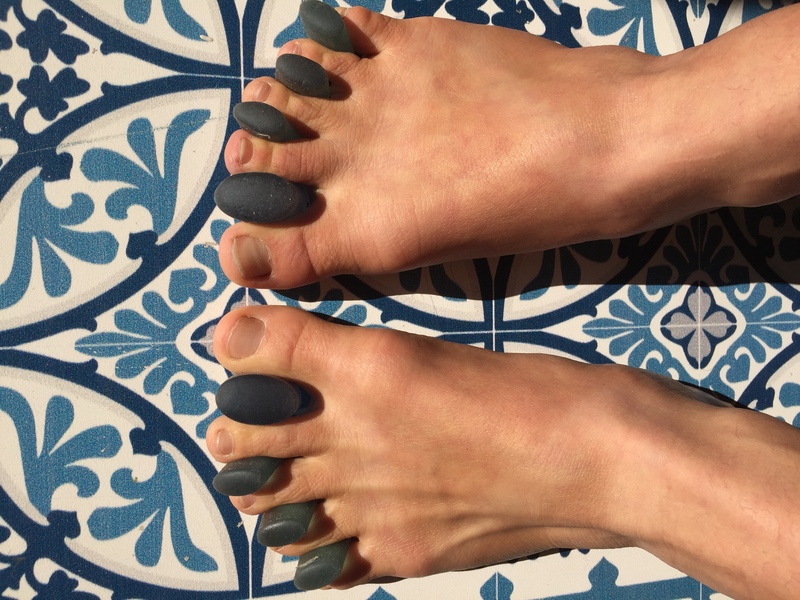 All toe separators are not created equal. They vary in durability, the ability to wear them in your shoes, and their price. And their size, too. I like stuff that lasts. This is one reason I am not a huge fan of the toe spreaders you can buy at the drug store that are intended to be used for pedicures. They’re basically a straight-to-landfill option and they don’t provide a lot of wearability or spread relative to other options. Toe spreaders that are designed to promote foot health range from about $10 to about $65 (USD). In general, you’ll probably pay more for toe spreaders that last for longer. Consult your budget and your heart on this one. Some – but not all – toe spreader brands offer size options. Usually the guidelines on the website are pretty clear – I’ve put specific notes in the reviews below. You get maximum toe spreading benefits when you can wear your toe spreaders as you move (and ideally while you walk). This means that you can wear them for more hours in the day. And when you walk with your toes spread apart, you get more of the forces and loads that will eventually help realign your toes more permanently. Of course, that also means you’ll have to have shoes with wide-enough toe boxes. Depending on the model, LEMS, Vivobarefoots, Soft Star Primal Runamoks, Altras, Drifter Leather and Unshoes all have some good options. However, if you’re buying a gift or don’t already wear minimal shoes, you might prefer a pair that doesn’t go inside shoes. You’ll still get lots of benefits. And if you’re just starting out with them, you’re not going to want to wear them all day anyway (it can be a bit too intense). I’ve tried out lots of types of toe spreaders. I basically love them all, but I use them at different times and in different ways. So I’ve written this so you have a handy guide. Here’s a list of my favourites, why I like them, and the pros and cons of each type. Durability: Moderate – I’ve had 2 pairs since early 2014. They’re getting small holes now but are still great for toe spreading. However, I only wear them to bed. Wearability: Best for chilling out and minimal walking or movement. Use them while you watch TV or sleep. General Comments: I love wearing these at night because there’s no worry about them slipping off my toes. It took a long time for me to adapt to wearing them all night, though. I’ve been woken up many times in the middle of the night by my feet telling me it is TIME TO TAKE THEM OFF! They’re a fun entry level option that won’t break the bank. Durability: Moderate to high – I’ve had mine for four years and worn them a lot and they’re going strong. They’re getting a bit gummy-textured – maybe I stored them too hot or too cold at some point during our reno because other people I’ve talked to don’t have this issue. Wearability: Good for walking around in the house, light exercise such as Restorative Exercise or yoga, and wearing while seated or driving. 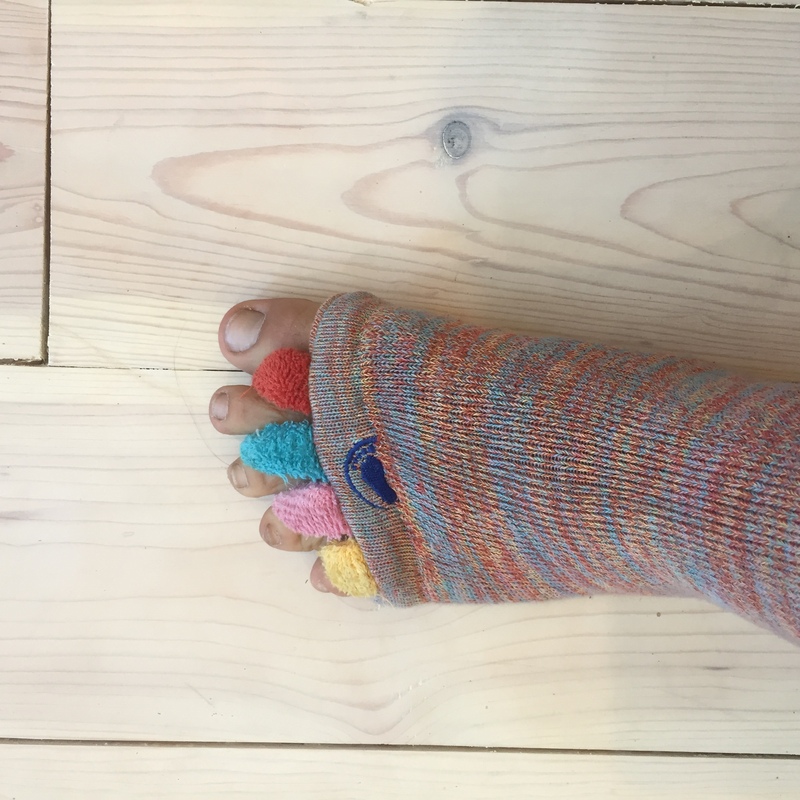 Sizing: They come in two sizes – most people should start with the small ones but if you or the person you’re buying for has big spaces between their toes then consider the larger ones. If in doubt, go smaller. General Comments: These ones are cute, in a strange way – there’s just something about the blue I really like. Probably not the best price to value ratio but being so attractive might make up for it on Christmas morning. Pick them up right here. Wearability: These are the gold standard – they’re designed specifically to be worn inside shoes. They’re also customizable so they can be altered to fit almost every foot. 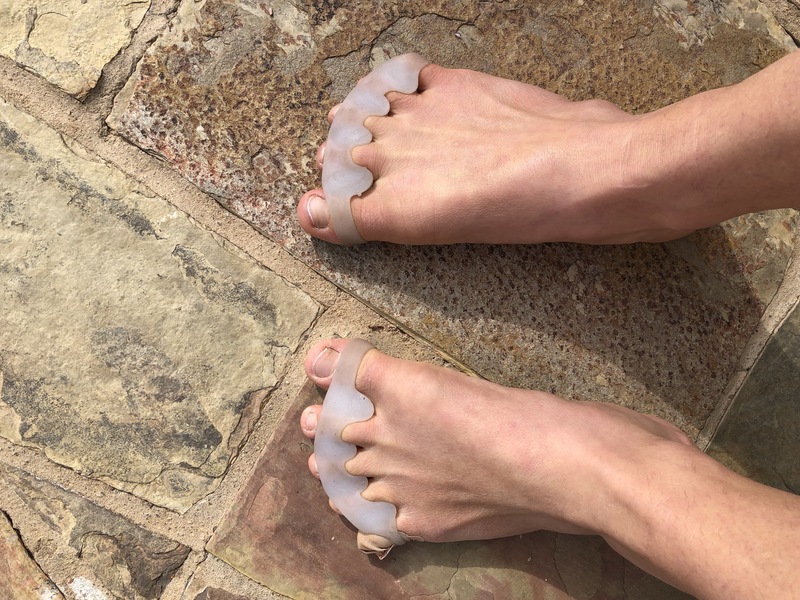 They can slip off very short toes (like mine) so for me they don’t work well if I’m just walking around barefoot, but for most people this isn’t an issue. Size: CorrectToes come in four sizes, based on shoe size. This makes the sizing easy to figure out. If in doubt, they recommend sizing up for wider feet (and presumably sizing down for narrow ones). General Comments: I love CorrectToes. They’re designed by a podiatrist who’s also a barefoot runner, and have had a lot of thought and care put into their creation. They’re the only toe spreaders I’ve found that work well in shoes, so if you or the person you’re buying for is already a toe pro, then these are your best option. Bonus! CorrectToes has a great guide to choosing shoes! Since not all shoes are wide enough, this is super helpful! Pick them up right here. Many real life retailers also stock CorrectToes and you may even find a practitioner who will fit and alter them for you professionally. Durability: Low – Medium. They’re made of very soft, squishy white stuff and I don’t want to test them on rough surfaces because they feel quite delicate. Mine are pretty new so they’re in good shape but they definitely got dirty fast. Wearability: I think these could possibly fit inside shoes but they have bands that go around the outsides of the pinky and great toes, which might make it tough. The same bands make them quite secure so I find them good for light indoor activities and for barefoot workouts as well as chilling out indoors. General Comments: I like these toe spreaders and often reach for them before driving. They’re the best ones I’ve found to wear while exercising barefoot and/or mobilizing my feet on a ball. Great price point, too! There are no hard and fast rules with using toe spreaders. But here are a few thoughts. Transition slowly and let your sensation be a guide. Wear them for an hour or two and when your feet tell you they’re done, take them off until tomorrow. I usually recommend getting a less expensive toe spreader to begin with. If your giftee likes them, then you can upgrade with a more expensive option next year. And you don’t have to feel guilty because they all are good for different things so people can actually benefit from owning a number of different styles. Almost everyone that I’ve talked to enjoys wearing toe spreaders – they feel pretty great to wear. I don’t think there’s a hard and fast rule for how often you should wear them. ‘As much as possible as long as it feels good to you’ is usually a good guideline. Be patient. 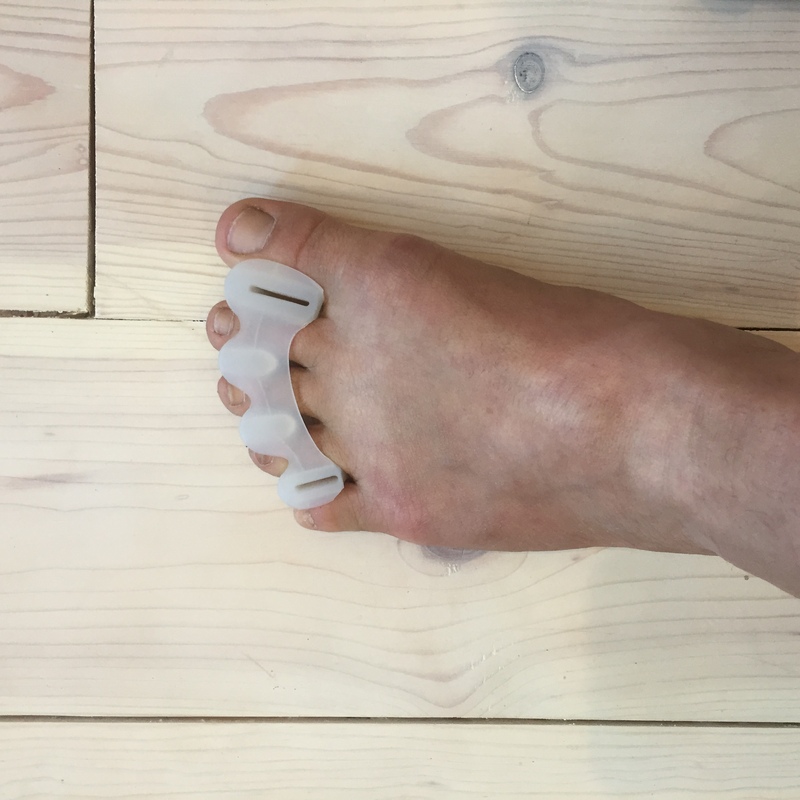 The end goal of the toe spreaders is to re-align your bones and rebuild the muscles of your feet so you don’t need toe spreaders any more. This can take a long time – possibly years. Do some exercises as well if you want to create more change. Toe spreaders are amazing but only one part of the puzzle. Toe spreaders are a huge time saver – and a major foot saver – but they aren’t the whole story. Here are some other great options to help you and your loved ones create healthy, resilient and pain free feet. These balls are fantastic for rolling out and mobilizing your feet (with or without toe spreaders on). Daily foot rolling and mobilizing is a really great way to restore foot health. This book by Katy Bowman is a great way to learn the hows and whys of healthy feet. 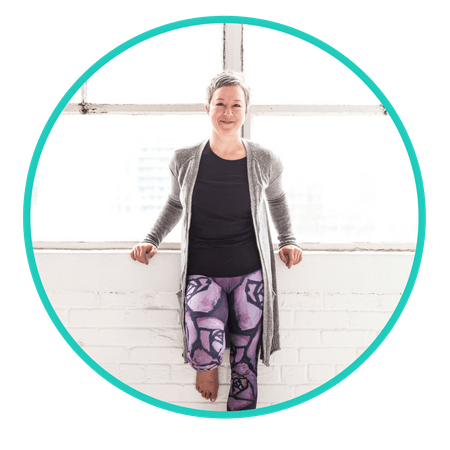 My online movement coaching program is packed with exercises, alignment info, and whole body movement tips. Take10 isn’t specifically for the feet, but since the feet are where movement starts, it’s a great foot health resource. And Still More Foot Friendly Resources…. Want some in-depth info and resources about how to unsquish your toes? No problem – check out this blog post. Ready to switch to minimal shoes? (If so, YAY!). Here’s a post I wrote with lots of tips on transitioning. I also have a free foot course that will give you more exercises, ideas and info. You can sign up below!